What is gender equality? Asking this question at a dinner party could bring the whole party to a screeching halt, as people start arguing about gender, pay equity, and why women do the majority of the childcare. 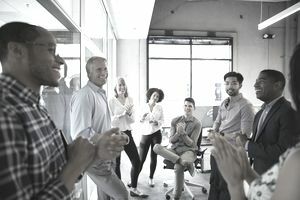 Your business can't fix the world's problems (and just what those problems are is debatable depending on whom you ask), but you can make your workplace a better place for everyone. Please note, you can't say, “Hey we want our business to be more female friendly, so we're going to implement special benefits for women.” This won't work legally, ethically, or motivationally as a way to deal with your workforce. You need to implement these actions across the board (with the exception of maternity leaves, which have biological implications). Men may take advantage of one area more than women and women may take advantage of another area at a greater rate than men do, but the key factor is that they are available to all people. Women, as noted, are often the primary parent—which means they are the ones who handle childcare, dentist appointments, and meetings with teachers more often than men. They need to know their schedules in advance to plan these things out. Otherwise, they have to either shuffle child care or call out with short notice. So often, people are promoted to management jobs based on their stellar performance as an individual contributor. That's fine. It's pretty standard. But, managing people isn't like doing the work (although most management jobs have an awful lot of doing in addition to the managing). In order to make your workplace comfortable for men and women, make sure your managers are trained in how to manage. If you're ever in doubt about whether or not you can legally do something, double check with your employment law attorney. Remember, it's cheaper to ask a question before than it is to pay the same lawyer to help you out with a lawsuit. Men and women want to work for great companies. Make yours great for all employees, and you won't have to worry about gender equality problems in your workplace.